The word “Maral” stands for “Red Deer” in the Turco-Mongolian languages even used in Farsi and Russian languages. The first hunts for this impressive game animal were organized in Mongolia and were renowned for their great success. However, due to excessive commercial utilization especially for the antler business the deer population deteriorated to such a level that the destination has been closed for Maral hunting. Recently Mongolia reopen Maral hunting but the trophy quality will be never big as such in Kazakhstan. During Perestroika we tested several different hunting areas in Russia. However, all the destinations – Gorno Altay, Tuva and Buriatia – have one significant fact in common: trophy quality never achieves the very high level found in Kazakhstan! There are various reasons for this difference: on the one hand hunting areas in Kazakhstan are open country, not heavily forested and steep valleys. Therefore natural preconditions are ideal for Maral Deer developing bigger bodies and by the way huge trophies. On the other hand hunting pressure in Kazakhstan is lower as the mountains are remote, steep and not easily accessible. Our hunting areas are even more wild nowadays than they were during the Soviet regime! With most Russian citizens leaving for their home country and remaining villagers seeking jobs and a better life in the cities, livestock breeding has declined dramatically in the mountain areas resulting in more undisturbed habitat for wildlife. The Tarbagatai is a smaller mountain range situated south of the Altai mountains. They were formerly also known as “Sair mountains” and form the boundary with China. In this area you’ll also find a diversity of game species: Maral, Siberian Roe Deer, Brown Bear and even the coveted Sair Argali in good density (Ovis ammon sairensis – currently closed to hunting), Wolf and Black Grouse. It is also possible to happen upon one of the huge wild boars roaming the region in smaller numbers. The Dzoungarian plateau is a vast mountain range situated in the south-eastern parts of Kazakhstan is a part of Tian Shan range (“Tian Shan” means “Celestial Mountains” in the Mandarin language).It is an tremendously beautiful mountain range and situated along the southern boundary of Kirghizstan. In this area roam varied species as Maral, Siberian (more “Tian Shan” type) Roe Deer, Tian Shan Ibex, Wolf and Rock Partridge (Alectoris chukar keklik). Dzoungaria is also home for the Littledale Argali (Ovis ammon littledali – currently closed to hunting). This destination is for Hunters who are especially looking for mix Tian Shan Ibex and Maral during their trip even if it is also depending of the hunting area. The Maral population here is good in numbers. The local Tian Shan Ibex population has an average density but is noted for remarkable trophy quality. Our biggest ibex from this area measured 142 centimetres, and Kermit Roosevelt’s 1927 all-time world record of 151 centimetres was taken at the Chinese side of the mountains formerly known a Turkestan. Anyway Ibex population is bigger in Southern part of Kazakhstan and if hunter need to harvest an Ibex we can advised to go before or after the maral hunt on other hunting area where it is possible to bag an Ibex in 1-3 hunting days. In addition the area hosts a fine population of “Tian Shan” Roe Deer with good trophy quality and long typical antlers with sometimes 5×5, Wolves are abundant and few bears (sub-species « isabellinus » so protected). The Maral (Cervus elaphus songaricus) is one of the largest deer found on the Asian continent. These deer dwell in the Taiga south to Lake Baikal, in Mongolia and in the Altai, Tien Shan and Quilian Shan mountain ranges of Central Asia. The biggest trophies are found in regions sparsely forested with conifers between 5 000 feet (1 500 meters) and 8 000 feet (2 500 meters) altitude. Due to our vast experience and proven cooperation with local authorities and outfitters we have access to some of the best hunting areas throughout the country where trophies weighing from 26 (12 kg) to 30 lbs (13 kg) are taken regularly. Each season some of our clients bag trophies weighing more than 33 lbs (15 kg), and our local record stands at an incredible 48,5 lbs (22 kg) ! 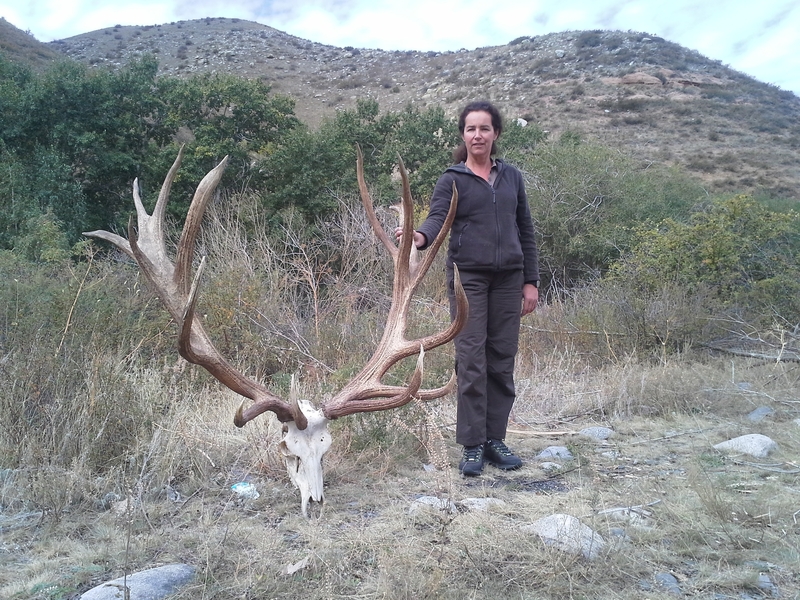 As a result we advice our hunters to be patient and not to shoot anything less than a 6×6 bull. Depending on the chosen hunting area and the location of base camp it is also possible to bag additional species which are listed below. However, be aware that not all other game animals are living in the same habitat as the Maral. For example, Siberian Roe Deer prefers lower elevations. We urgently ask our clients to tell us their preferences prior to the hunt. This enables us to put you in the right area and to fulfil all your expectations. The Siberian Roe Deer (Capreolus capreolus pygargus) is the Asiatic extension of the European Roe Deer. Up to twice as large in body size and with main beams up to 18 inches (45 cm) long it has an impressive yet still elegant appearance. Bucks from the Tian Shan area usually feature longer antlers than those from the Altai region which are more massive. The Brown Bear (Ursus arctos) found in our hunting areas usually weighs from 350 – 900 lbs and is practically identical with the North American Grizzly. The best trophies are bagged by our clients in the Altai and Tarbagatai regions. Please note that taking a Brown Bear in these areas requires CITES 2. Whereas bears are protected in the Tian Shan region. The Musk Deer (Moschus moschiferus) is a small member of the deer family. It features exceedingly long, fang-like canines and highly sought-after musk glands. In proper areas with heavy cover it can be abundant but is very shy and mostly nocturnal. The Musk Deer is listed under CITES 1 and today without licence for foreigners. The Siberian Ibex (Capra ibex sibirica) is not very abundant in the Altai mountains of Kazakhstan, and trophies are less spectacular than in the higher altitudes of the Tian Shan mountain ranges. Trophies from the Altai usually measure 31-43 inches (80-110 cm) whereas Tian Shan ibex average at 43 inches and can exceed 55 inches (143 cm). If you are interested in an ibex trophy it could be better to plan a first week in Southern Kazakhstan (Tian Shan Mts) or to do a special hunting trip in Kirghizstan. The Asian Moose (Alces alces cameloides) is an interesting subspecies although antlers are less widely palmated than those coming from Kamchatka and Alaska. However, in Kazakhstan moose have been closed to hunting since 2000. We are expecting news licences for foreigners. The Wolf (Canis lupus) is very abundant in all Maral hunting areas but mostly taken by chance as he is as shy game. CITES 2 is required for trophy exportation. Besides Big Game, Kazakhstan offers also an abundance of upland game birds. The Capercaillie (Tetrao urogallus) can be hunted in the Altai area but is more abundant in the Russian Taiga. Black Grouse (Tetrao tetrix) abound in dells with deciduous forest in the higher Altai and Tarbagatai regions. Grey Daourian Partridge, Rock Partridge (Chukar), Quail, Woodcock, Solitary Snipe and different species of ducks can be hunted depending on location of the camp. Some of our hunting areas also offer free fishing for Grayling, Arctic Char and other kind of fish. If you are interested please contact us prior to departure. The ideal time for hunting Maral in Kazakhstan is during the rutting season taking place between 10 September – 10 October. During this period – the “Indian Summer” – the weather is usually clear and dry. Nights are cold and sometimes frosty. Temporary snowfalls can be expected at elevations above 6 000 feet (1800 meters) altitude. Another recommendable season is during wintertime until late December when the Maral bulls going to lower elevations and can easily be tracked and spotted in the snow. Maral hunts are usually conducted on horseback with the final stalk done on foot. Our horses are very calm and absolutely reliable and sure-footed even on steep slopes. Each hunter is accompanied by one or two local guides who are very experienced and skilled masters of the outdoor life. Depending on the region and the client’s ideas it may be advisable to leave base camp and hunt for several days from tented fly camps in remote areas with low hunting pressure. If your focus is a really big trophy you will usually get the best opportunities far from civilization and comfort! 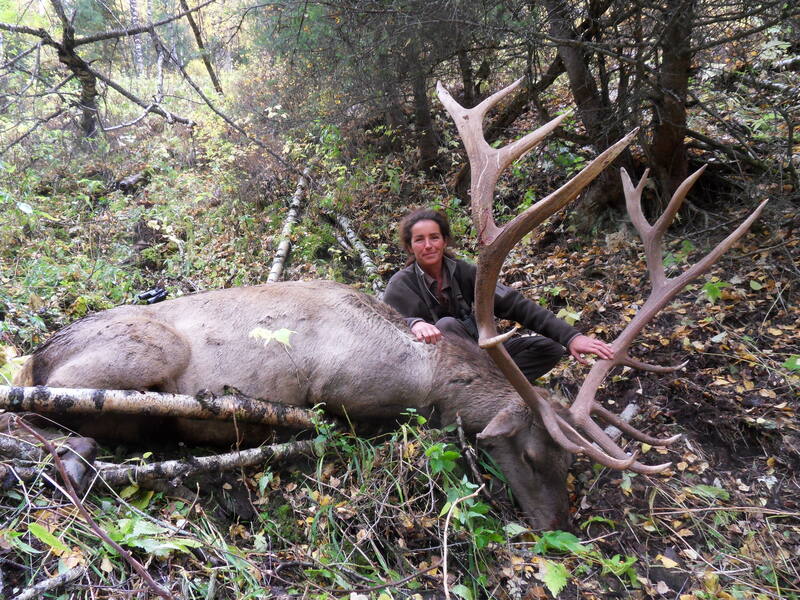 On special request we also provide professional hunting and guiding assistance through our experienced PH’s. We highly recommend this option to clients looking for exceptional record trophy book. We advise our hunters to use powerful rifles suitable for long-range shooting. Maral bulls are very strong and tough animals especially during the rut, therefore the recommended minimum calibres are the 7 mm Magnums (7 mm RM, 7 mm STW, 7 mm RUM). Better suited are the .30 Magnums and upwards – .300 WM, .300 Weatherby, .300 STW, .300 RUM, .30-378 Weatherby, 8x68S, .338 WM, .338 RUM, .338 Lapua, .30-378 Weatherby, etc. In any case premium bullets like Barnes X, Nosler Partition/Accubond, Winchester Fail Safe, etc. will deliver the best results. Long range shooting practice – up to at least 300 yards – is highly recommended prior to the hunt. A detailed list of necessary equipment can be provided upon request. A valid passport (minimum 6 months validity from end date of the previous journey). The visa has to be applied for prior to departure by the client but to improve the tourism development some westerners do not nee more visa for trip less than 15 days. Check the Kazakhstan consulate near your home to know if you need a visa or not..
For issuing the rifle import licence please send us a photocopy of your passports first pages and your rifle data (brand, model, calibre and rifle number) either by fax or by mail when booking your hunt. For issuing the Kazakh hunting permit please send us photocopies of any personal hunting licence and/or your rifle licence (the latter if required in your country). We recommend a minimum of 8 full hunting days. However, our packages are planned as 14 day round trip including 10 full hunting days ensuring you ample time to achieve your goals. We will inform you if it is better for you to fly to Astana airport (TSE) then Oskemen (UKK) as final destination or if it is better to arrive in Almaty airport (ALA).